Someone told me, I think it was Mrs Bovary, that after 35, women don’t need to eat as much protein. And ever since then – I don’t know if it’s psychosomatic or what, but I’ve been feeling like she’s right. I don’t need to or really want to. I’m not a no-meat person, I’m a not-very-much meat person. And I find that with a lot of dishes, just a dash of meat to add the undertone of umami brings meaning and purpose to a dish almost entirely composed of vegetables. 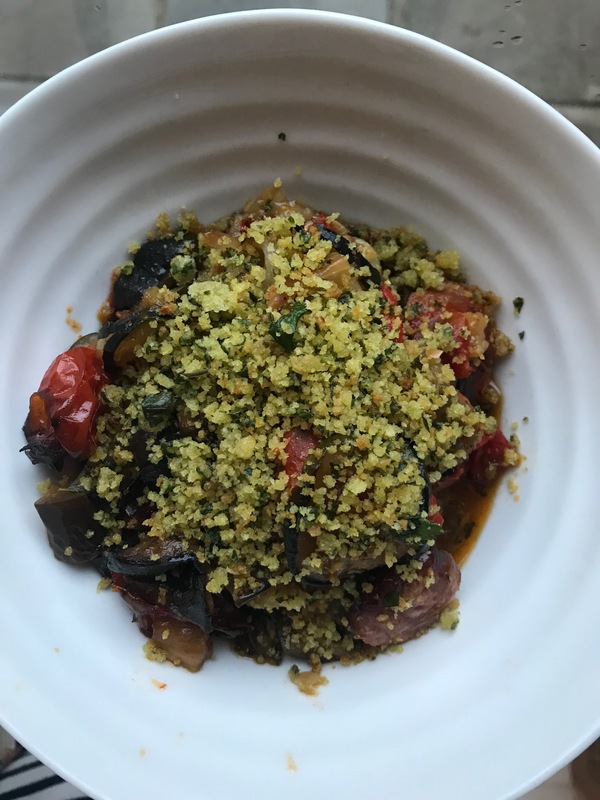 So it is with this summer stew of aubergines, courgettes and peppers, which you can flavour with a single cooking chorizo or two slender merguez or even an Italian sausage if you like. I have always made the mistake of doing this kind of vegetable dish roasted dry in the oven, resulting in a charred, post-apocalyptic catastrophe. Braised gently in the oven with some stock, you get something almost fresh. 1 In a casserole that has a lid, gently heat about 2 tablespoons of olive oil and put in the sausage, onion and garlic. Turn all this until the sausage is browning at the edges. 2 Tip in all the chopped veg and turn it in the oil a bit. Throw over a big pinch of salt, the vinegar and about six or seven turns of the pepper grinder. 3 When it’s all looking pretty hot, pour in enough stock to come halfway up the sides of the veg, it should sort of pool around but not drown everything. Keep this on the hob until the stock starts to steam or even simmer a little. 4 Put in the oven with a lid on for 1.5hrs. Stir once after 30 min and again after one hour. Avoid if you can stirring the pot after the veg have started to soften and collapse or you will get a mush. If you feel like you need to do something, give it a shake. If you’d like a bit of a decorative burnish to the top of your stew by all means turn the oven up as high as it will go and give it ten mins or so to achieve full potential. In the photo above I have added a pangratto, which is Italian for fried breadcrumbs. I whizzed up some bread in a whizzer with olive oil, garlic and parsley and then fried it for about 10 minutes in a dry frying pan. This is totally optional. Great idea; a sort of ratatouille (I adore ratatouille) with sausage. Delicious. Looks lovely. I thought you literally meant Emma…. Long day. I will definitely try this thank you. I feel the same about meat – I was brought up thinking I hadn’t had a ‘proper’ meal if I hadn’t had meat, but I can manage just fine without it, same as puddings, really. At the risk of sounding like a div, do you de-salt the aubergine chunks beforehand? Thanks…and by ‘de-salt’ I obviously meant the thing where you pour salt on the chunks of aubergine and then weigh it all down for hours and extract the bitter water from it. Looks great. Did your kids eat this one? HA HA! No way. as if. Great recipe, I’ll definitely be giving that a go. I’d have to disagree about decreasing protein as you get older though. As you get older muscle wastage (horrible word) !! kicks in so working those muscles – just think carrying heavy bags of shopping not pumping iron for hours in a sweaty gym – + protein is a good way to go so I’m always looking to increase my protein but not necessarily using meat. I love the new format for The Spike – really enjoying it. I am in total agreement about the wanting/needeing less protein thing. I used to be a massive carnivore but I could take it leave meat now and often order the veggie option. So weird..
I’ve been vegan – or more specifically following a vegan diet, rather than also throwing away my shoes and make-up – for a few months and I really recommend it. I feel so much lighter – literally and metaphorically. Reckoning I can make this without the sausage. But maybe with some paprika and perhaps a gremolata? I made this tonight- absolutely delicious.The breadcrumb topping is brilliant.